Join the discussion on our forums! 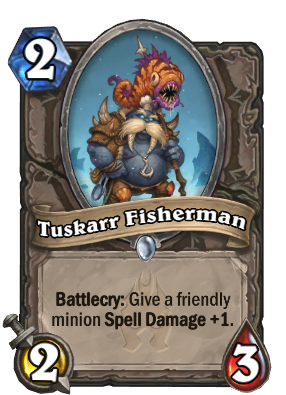 Come discuss Tuskarr Fisherman over in our dedicated Tuskarr Fisherman discussion topic. Battlecry: Give a friendly minion Spell Damage +1. If you bring him 500 fish, he'll give you this sweet Kalu'ak Fishing Pole. That's one ugly looking fish... thing. I could imagine this card getting used in wild with Brann Bronzebeard and a stealth minion. Maybe in rogue where you can bounce it back and forth to create a stealthed minion with spelldamage+6. And then you let it rain Razorpetals. This might work surprisingly well in token druid. Disagree wholeheartedly. This card is literally the epitome of design space, whether it's good or not (which it looks to be). Effects like this can single-handedly create combo decks from thin air and have done so multiple times in the past. If you think this card is filler, you're obviously not a very good deckbuilder. It kinda has synergies with all the cards that get immense Deathrattle effect when they die during your opponent's turn. Forces your opponent to either ignore the Spell Damage +1 or kill it to benefit you. Don't think it's a question of whether it's better than kobold or not because we have that new card Tainted Zealot. Literally just better than kobold in every way, especially with new synergies with cards like Spirit Lash and Defile. It survives as a 1/1 with lash where kobold would just die and if you get defile to cast a second proc, it does 5 or more damage to the board guaranteed. Tuskarr Fisherman probably just isn't as good as zealot, but it also goes in a different deck. I could see this in a combo rogue with a cheap, resilient stealth target, buffing it up for days and getting a mini maly. This card is extremely creative. it's cheap spell damage... and potentially a lot of spell damage. Depending on how it's used it could give token/minion based decks a lot of spell power for a burst turn or for just clearing annoying high health taunts. Hey look Blood Imp! You might be useful for something! Oh wow. I didnt know that. Thank you for telling me.